From trackside camping to five-star luxury, we tell you where to stay near the Red Bull Ring for the 2019 Austrian Grand Prix on June 28-30. Support the future development of F1Destinations by reserving your accommodation through the Booking.com links on this page. You won’t pay more and we receive a small commission. You can also add accommodation to your Official Ticket Package from F1 Experiences. The Red Bull Ring is located in a rural region (much like Spa-Francorchamps and Circuit Paul Ricard), which means that there is a scarcity of accommodation close to the track, aside from camping. Teams and regular visitors quickly snap up what is available in the villages surrounding the circuit, like Spielberg and Knittelfeld. Unless you are planning to camp next to the circuit – which is a great option, but not for everyone – then we recommend staying in Austria’s second largest city of Graz, which is about 75km from the circuit, or less than an hour on the motorway. Thousands of fans from all around Europe camp at the Red Bull Ring on Grand Prix weekend. The camping facilities are good and the atmosphere is lively, though a little drunken and rowdy at times. If you value a good night’s sleep or have young children, it’s perhaps worth considering alternative accommodation. There are seven color-coded campsites surrounding the circuit. A weekend of camping for two people costs approximately €160 (3 nights from Thursday to Sunday, including parking for one vehicle). The ‘Pink’ and ‘Orange’ campsite on the hill behind the Nord grandstand are probably the most picturesque and least likely to be noisy, but there are more hills to climb. The other camping areas are located on flatter ground, closer to the main straight and fan zone near the first corner. There’s also a big stage close by where concerts are held over the weekend. Buy Red Bull Ring camping tickets. There’s a good selection of accommodation in Graz, but it’s not a huge city and it does suffer from the dreaded ‘F1 tax’, with higher prices on Grand Prix weekend. There are trains from Graz to the circuit, but we recommend hiring a car to make your life easier. Trackside parking is free and the circuit is close to a motorway, meaning that traffic flows quite well. Expect a commute of around 1 hour each way. There was more traffic after the race on Sunday, but no significant delays. 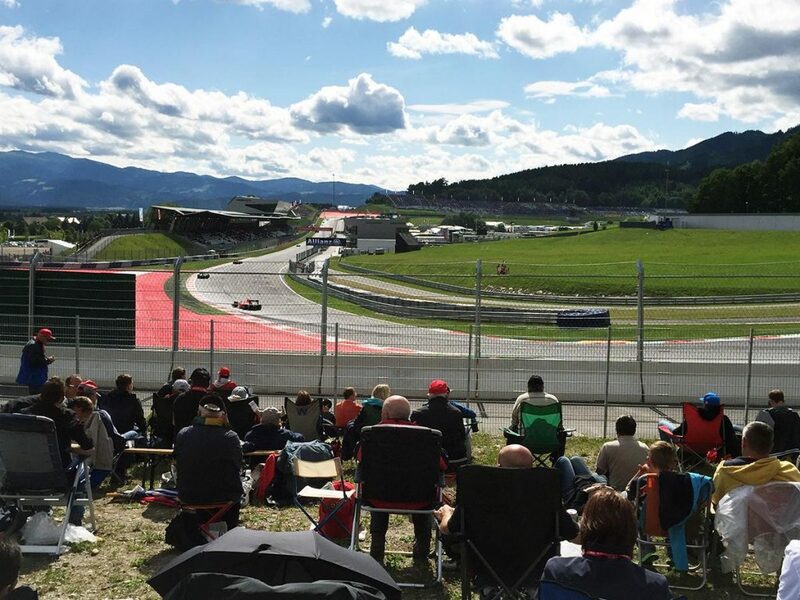 Official Ticket Packages from F1 Experiences at the 2019 Austrian Grand Prix include grandstand seats plus exciting additional benefits such as a Drive the Track Tour, Insider Access to the F1 Paddock and meet-and-greets with F1 drivers. Select packages also include access to the Formula 1 Paddock Club. Add a 4-night stay at the modern LendHotel in Graz, which is owned by Red Bull advisor Helmut Marko and features several Formula 1-themed displays! Daily coach transfers to and from the Red Bull Ring are included with accommodation packages. The area surrounding the Red Bull Ring is ski country, so there are plenty of pretty mountain chalets to choose from within a 30-40km radius of the track. You’ll find beautiful rolling green hills and fresh air instead of Snow in July, not to mention tasty local cuisine and beer. Have you stayed near the Red Bull Ring? Leave a comment below! Thanks for the work on this site. I am planning a trip to the Austrian and British GP in 2018, travelling from Australia. . Camping with a large Motorhome and I am wondering the best option for camping at the RedBull Ring. We will have Grandstand tickets in the RedBull stand. Seems each site has “Pros & Cons” ie noisy but close or Picturesque but a bit of a walk. Hoping who could help with a bit of advice on which is the most comfortable/clean and convenient. Hi Peter, I’ve not camped at the Red Bull Ring, so my advice is based on the areas I saw last time I was there and their locations. I think you need to choose one of the Blue, Red or Yellow camping zones. These are all pretty close to the Red Bull grandstand. As far as I could tell, all the camp grounds looked pretty similar in terms of conveniences. As for noise, I think it is luck of the draw. You can buy tickets here. Good luck, sounds like an awesome trip! Had a awesome time and recommend to all. The Austrians know how to have a great time in a good way. The camping was clean and comfortable and everything is available at the track with site Hoffer which is Aldi in OZ. Facilities are well maintained and never encountered them to be dirty, though recommend to get to showers early as a line up occurs. Noise is what you would expect of a festival of speed. Viewing was incredible overall from Redbull stands and recommend it. Will hopefully get back soon. Thanks a lot Peter for your feedback. The Austrian GP is an underrated race. The spectator experience at the Red Bull Ring is really good and the tickets are reasonably affordable too. Hi Andrew. Am looking at heading out for my (and my brother’s) first F1 trip and Austria looks the best bet for us. I am treating him for his 40th so want to budget the accommodation and transport especially as I’m coughing up for the entire trip. I was looking at camping but given the distance from Vienna airport is the additional cost of a hire car inevitable? Or would public transport and pre erected tents be an option? My brother cannot carry much due to injury so need to limit amount of luggage generally. Have you any advice on this at all? Thanks for you time and a very useful site. I think a hire car will make your life much easier at the Austrian GP. Public transport is doable, but more of a hassle. You may also consider a cheap hotel in Graz rather than camping.